Adding Dual Monitor Kit: Please note that 97-783 kit "decreases" total weight capacity to 19 lbs for this arm. Also the outside width of the monitors should be between 14" to 24.5". Monitors greater than 24.5" are not compatible and monitors with less than 14" in outside width will have a gap between the two monitors. The Ergotron 45-360-026 is a versatile arm. Use it to mount a second monitor within a sit-stand workstation or mount a large monitor or TV where you want! Question: Can 2 of these arms be mounted on a single pole? I need both the monitors to swivel individually. Answer: No, you cannot mount 2 arms on a single pole. Question: The top of my desk is 19mm thick, and the specs say 20mm is the minimum. Can I get away with it as-is, or would I need to bolster the thickness with an appropriately-sized wood block on the underside of the desk in the location of the mount? 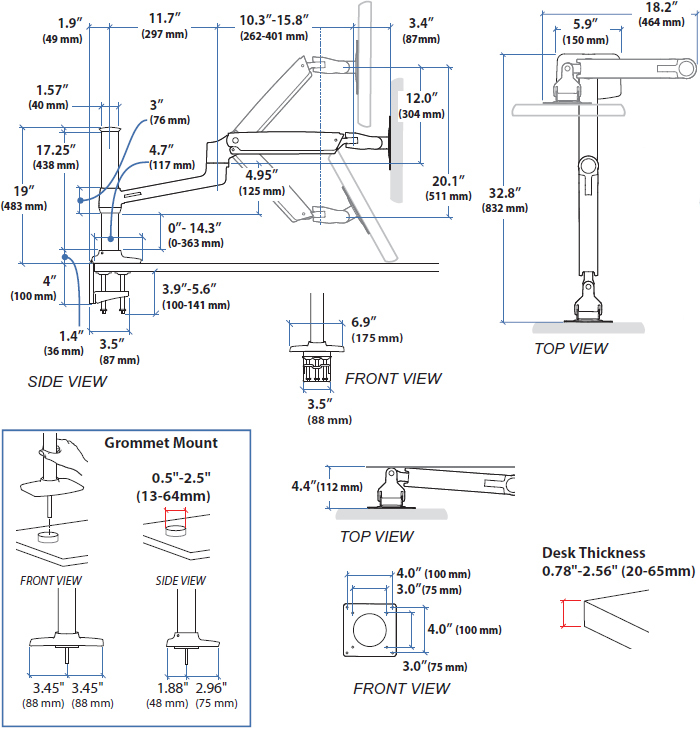 Answer: The 45-360-026 Desk Mount Arm attaches to a desk of thickness from 20 mm (0.79") to 65 mm (2.5") with a desk clamp. The manufacturer of this product, Ergotron, had the following to say about this particular situation, "According to the picture the desk top is 19mm - the customer may want to double check to make sure, because we only warranty the 45-360-026 for a minimum of 20mm to a max of 65mm. It is their discretion to use this mount on her table, as it ALMOST meets the minimum requirement. That being said, we do not necessarily advise this as our engineers have tested these desk thickness specs, so that is why 20mm is our minimum requirement." So though a 19mm thick desk may work, the arm will not be covered under Ergotron's warranty. Mounting Pattern VESA MIS-D, 75/100 (hole pattern = 100 x 100 mm & 75 x 75 mm), MIS-E (hole pattern = 200 x 100 mm), MIS-F (hole pattern = 200 x 200 mm ONLY). it takes up a lot of room... maybe designing trimmer, sleeker. Once Wacom 27" mounted... it's a REAL job dismounting to switch out wires. Doesn't go low enough or long enough to sit in my lap :( I have to hold arms to move in the back and wish it tilted more. it's sturdy, frees up desktop space, rotates and moves around. holds the monitor up strongly. I am using this with an Apple 27" Thunderbolt Display (using a separate VESA back plate). It has no problems with this monitor, and it is effortless to move and reposition. I called their sales line to find the right product for me - a monitor arm that could support a 30 inch monitor, rotate 90 degrees, and support both a sitting and standing configuration. The product was spot on, not to costly, and I expect, like my other Ergotron monitor arm that I purchased almost 10 years ago which is still going strong, will last just as long. Highly recommend not only this product, but the company for their knowledgeable staff and service.